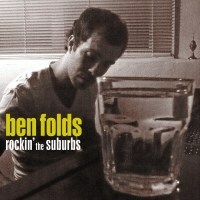 A re-release on vinyl of Ben Folds’ 2001 debut solo album Rockin’ the Suburbs is due out in February, and a solo tour later in 2016 is in the early planning stages. A listing by independent music retailer Bullmoose shows the album set for a February 26 release date for the two-disc set at a list price of $39.99. The pressing will be on 180-gram yellow vinyl and will include Hiro’s Song, the bonus track from the original vinyl release and the Japanese CD. It’s being released by ORG Music, which also re-released the Ben Folds Five album Whatever and Ever Amen. Following the symphonic tours in the first few months of 2016, Ben has decided to do some solo shows that will showcase some of the hits from Suburbs as well as assorted newer material. The tour is still being put together, so keep an eye out for dates and locations. You’ll recall that Suburbs was Folds’ first venture as a solo artist following the breakup with Robert Sledge and Darren Jessee of Ben Folds Five. The session was recorded in Adelaide, Australia, the hometown of his then-wife Frally Hynes. The album peaked at number 42 on the Billboard Hot 200 album chart that year, and the title single reached number 28 on the Modern Rock Tracks chart. Original vinyl copies have been selling for anywhere from $75 to $350.